Last Saturday some of our little sewing group/tea society met at Waveland Estate at the edge of town for a Regency-themed picnic. It was a morning of mixed promise, hazy blue skies and sunshine in one direction, and a cobalt blue enhanced with gray in the other. Rainstorm, I thought, that's what that is, rain in the making. Sure enough, mountains of clouds moved somewhat overhead, pinches of blue above their enormous lumpy sides, but they just spat sprinkles on us while we lingered over the picnic. Jane remarked that we wouldn't melt, so there was no mad pick-up and dash for safety. I had forgotten, of course, about how my sleeveless spencer and water don't mix, so it's lucky the sprinkles were scant because while I might not dissolve into a puddle, the spencer surely would have been ruined. Oh, how we feasted. We paid as much attention as we could to creating the atmosphere: luncheon dishes and teacups and wineglasses, and a block print tablecloth for a colorful background like the skirts of an early Regency dress. Then there was the food...oh, the food. 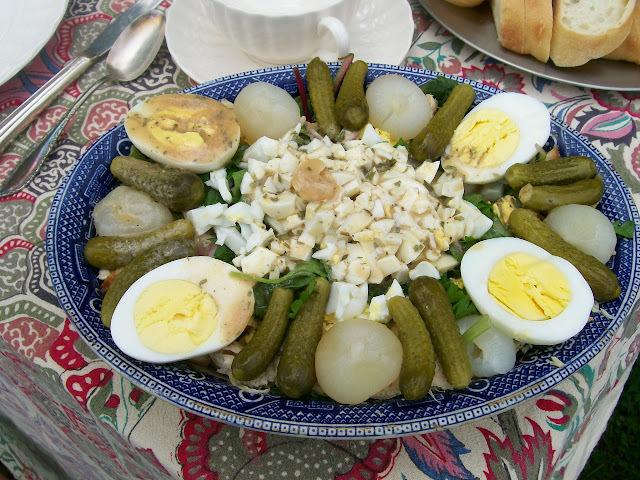 Why did such dishes ever lose their way in history, and become lost and foreign? Chicken pudding, onion pye (with potato and apple), Salmagundi, a solid whip't syllabub, lavender cheesecake, good bread with Seville orange marmalade, tea piping hot -- Maryanne's Wild Abandon (Bingley's Teas) and Jasmine Darjeeling (Montea), real honest-to-goodness Mount Rainier cherries. Salmagundi: a composed salad with the scents of lemon and herbs. Whip't syllabub: light, cold, and creamy all at once. All eaten to the tune of a breeze and birdsong and lots and lots of conversation and chatter, under welcoming old trees and the shadow of Waveland. We sat so long that plans to tour the home were tossed aside, so we strolled around the grounds and gardens. Polly identifying flowers. The garden is maintained by a garden club my mother's a member of. They use lots of native and heirloom species, drought resistant, perennial. Polly and Autumn Jane consider the afternoon. 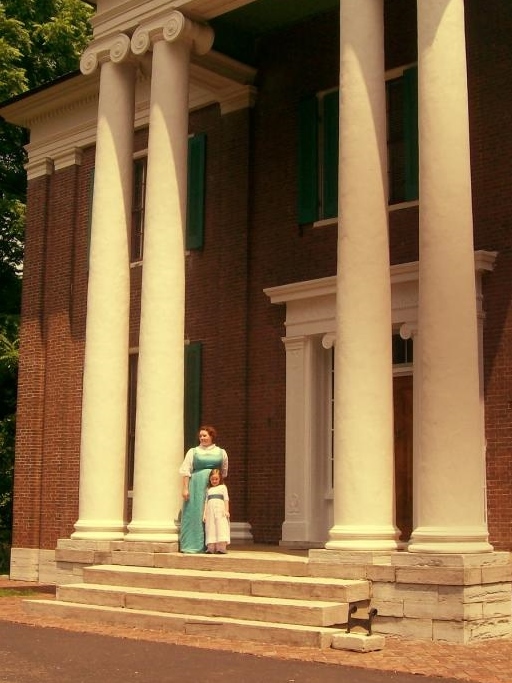 Jenni and Autumn on the estate's massive portico. Jenni wrote about the picnic too: she has much better picnic pictures, since my camera chose to hiccup and then go dead. That's also why she and Laura are not in any of the pictures just yet. This was the spencer's first step into the world, a beta test to see how it, and the rest of the ensemble, performed. 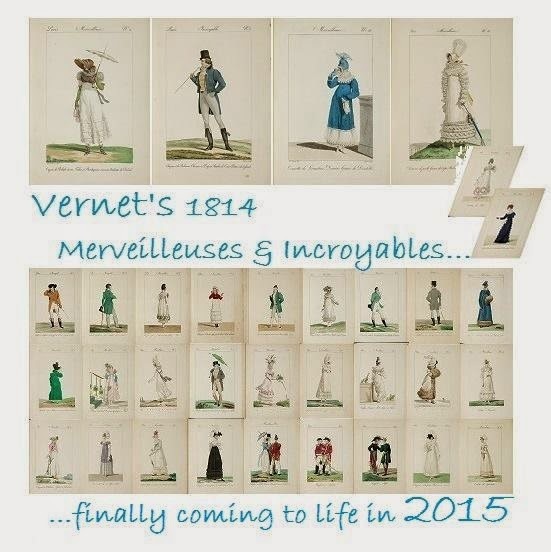 Now refinements can be made for the Jane Austen Festival in July. but this picture reminds me of some Eastern European dress. magnificent, aren't they? The steps are native limestone, worn with rain and feet. The spencer itself turned out to be comfortable. Yes, it's another layer over the dress -- two, counting the lining -- so perhaps it was a little warmer than I anticipated. However, the natural fabrics did what they were supposed to: they wicked away the ladylike "glow", leaving me, if not cool, at least upright. Despite years in Atlanta's jungle-like humidity, I've always wilted in the heat, so knowing if I can even stand the garment on a hot day is useful information. The spencer, laced. Nice sneaker laces, eh? spangles twinkling as the spencer moves. 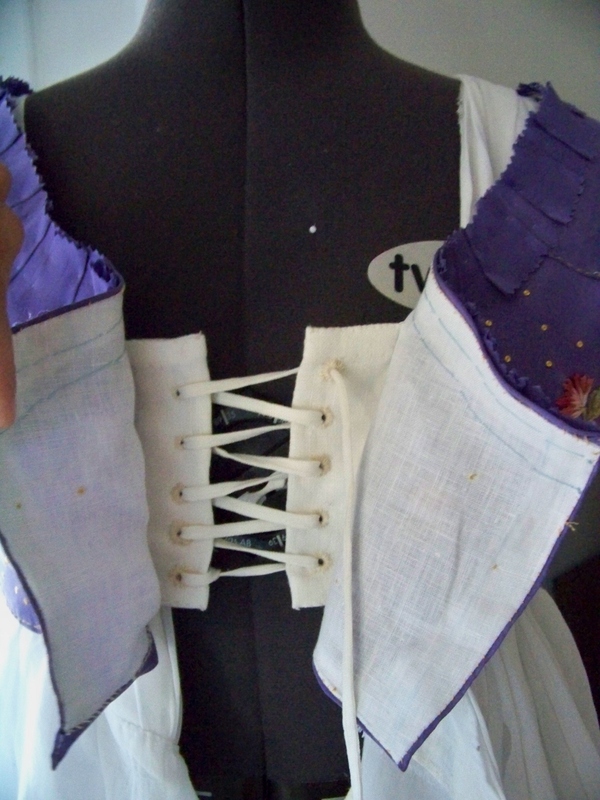 The spencer's interior lacing worked beautifully to set the garment in place. It didn't shift and wrinkles were minimal and natural. The fronts are pinned from inside. I do need three pins, top, middle, and bottom...this wearing I only had two, and the middle of the overlapped front pulls a little. The back is where I am concerned. Remember how the back is lower than originally designed, and how I built up a high ruche to mitigate this? Well, not high enough. Plus, my chemise is showing. Our house has no full-length mirror, if you don't count the 1920s mirror set into a door that's so de-silvered the view is obscured with dots and splots and scratches. Therefore, I left the house gaily unaware. The solution? Add a ruffle to the dress neckline, to match that on the hem. It will fluff over the ruche, obscure any wardrobe malfunctions, and in the front provide some welcome screening. Plus, the ruche bows out a little in back. I will take two tiny pleats in the top of the back to pull it all inward. Bowing on the back ruche, peekaboo chemise, but still a pleasant, fresh effect. Oh, one last note. It's impossible to tie arm ribbons onesself. I've tried it. Many times. So we tied them at the picnic, and I failed to notice that the sleeves are poofed out shorter in back than in front. They should be the reverse with longer ends in the back, to get the nicest drape. A memo to file for the festival: examine your sleeves! I was just going to say, "Can you imagine all the items a woman would have to think about before stepping outside?" Then I remembered that I check for bra strap peekaboo, skirt hang, zipper condition, muffin top, hair muss, and make-up smear before I go outside today. Different era, same concern. All my livelong life, I've warred with my curls. For decades, I endured frizzhead, bobble-curl, and the electric-socket look. Until the Flatiron Age. Now I sport straight hair with flipped ends. Ahhh. Now, here I was trying to make the hair hold ringlets, especially in front and it did...but only in the back. Even the humid air didn't help. It wasn't the beach humidity that creates Greek ringlets, just Kentucky humidity that pulls individual hairs into a Mrs. Frizzle bob. Fine for 1780s, not for 1794-6. Yes, I hear you, and no, I didn't put Lottabody on it, that fantastic setting lotion. I reserved that for the artificial pin-in curls that I tried that morning, and gave up on because they looked flat ridiculous. Hrrmph. So we had that morning hair au naturel, with a silk gauze bandeau. Cute, but not the Master plan. So, between now and the festival, it's hair play time! We'll set it with Lottabody in foam curlers, we'll test the famous papillote curls, we'll "turn up" chignons at the ends per Gallery of Fashion, and we'll twist and tie turbans a la Festive Attyre (thank you!) until we have something a little more of the date. I'm looking forward to this. Oh, wow! It's great to see this project come so far. It's gorgeous. The bodice looks fantastic! I want to have a proper Regency picnic one day! I liked how at dinner they served all the sweets and savouries together, but we all know I would have just eaten all the desserts! Thank you both! Oh, I am pretty sure some of the savories, at least, might have tempted you. They made some pretty terrific dishes. Looks like a lovely event, and the spencer is just perfect, I think! Good plan on the hair. I was mulling doing something like that; now you've convinced me. I've already had a sneak peek on your dress at Jenni's blog and was so eager to see more pictures! It's such a beautiful little garment and although 'little' it has such a huge effect on the whole dress ensemble! Isn't it also amazing that acutally wearing a finished piece often reveals some tweaks, which are yet to be made?! I think we have all experienced this and I wonder wether the women back then would have, too...sometimes a fabric slightly changes with the warmth of the body, sometimes they stretch or mold. This is when 'history' truly gets alive and we can get a glimpse of the past. And of course I cannot finish this comment without mentioning the wonderful range of period food! 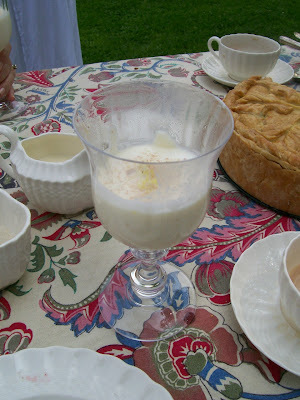 Aawww syllabub, that heavenly beverage - it's such fun to taste the past. A truly lovely picknick...and I'm looking forward to do some more armchair travelling to the festival with you! You are so right! I am positive women in the past tweaked their clothing. 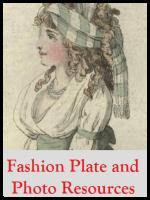 Fanny Burney mentions many times spending afternoons on caps and other accessories, for she always had to look fresh. It appears that she spent time sewing nearly every day. You're right, the bodice entirely changes the dress. If I can locate it, I think the lilac petticoat underneath will alter the feel, too. How I wish you would have been with us. Of course I will take as many pictures, and videos, as possible at the festival. We can armchair travel to each other's events! You like syllabub, too? I want to try it with a very light summer wine, perhaps a Riesling or the dryish Kentucky wine made just miles away that we quaff icy cold every summer at Ecton Park jazz picnics and in the garden. Lovely photos! Thanks for sharing your day. It's whimsical AND elegant! I love the spencer. The color is spectacular in the photos! the spencer has turned out beautifully! I especially love the embroidery, that must have been tough to make! Also, the gown is delicious. The sleeves, ah! As for your hair, I feel with your pain! May I suggest, if you have not tried it already, giving a shot to old-fashioned rag curls? My hair usually does not hold a curl no matter the amount of products I use, but if I set my slightly wet hair into rags and sleep in them, I have nice curls for about three days without any product at all! Btw, is that your daughter? Such a cutie<3 The dress suits her so very well. Have a lovely summer and I'm looking forward to your posts! Alas, Miss Autumn is not my daughter, but that of my friend Jenni, who has the blog "Living with Jane". Both are sweethearts. I hadn't thought of rag curls, but will very shortly! The Jane Austen Festival is coming up, and I will be needing curls, curls, and more curls. Very best, and may you be well this summer! Very pretty Spencer! And that syllabub looks delicious! The spencer is just gorgeous. I totally understand your feelings about your curls, but the sooner you come to love them the better! :-). I highly recommend Naturallycurly.com and the book Curly Girl Handbook. You are not alone, it took me a long time to learn to love mine. Looking forward to catching up on your blog, your boys are adorable. I'm very much behind on my blog reading, so I didn't get here utnil now. I think you look smashing! A very romantic look and pretty too! :} Glad you think it turned out well. 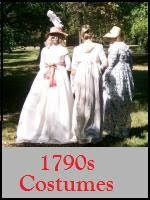 I'm experimenting today with gathering the upper sleeves, just for a change, for this weekend's Jane Austen festival. Embroidered Sleeveless Spencer: Finished at Last!